The NR90GC2 3-1/2 inch Gas Powered Paper Collation Framing Nailer combines cordless utility with traditional framing nailer power. No compressor noise or hoses to wind saves time and energy. Improvements on this second generation tool include a new air filter design, reversible rafter hook and a new switch, which requires less pushing force to operate. 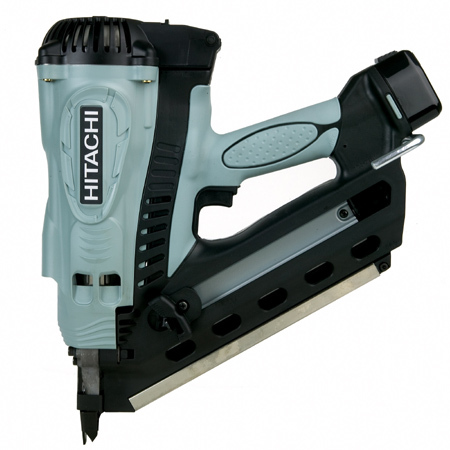 This gas nailer is ideal for general contractors, remodelers, construction and service workers who do framing, sub-flooring, fencing, sheathing, decking, truss build-up, modular housing construction, remodeling and punch-list work.The NR90GC2 3-1/2 inch Gas Powered Paper Collation Framing Nailer combines cordless utility with traditional framing nailer power. No compressor noise or hoses to wind saves time and energy. Improvements on this second generation tool include a new air filter design, reversible rafter hook and a new switch, which requires less pushing force to operate. This gas nailer is ideal for general contractors, remodelers, construction and service workers who do framing, sub-flooring, fencing, sheathing, decking, truss build-up, modular housing construction, remodeling and punch-list work.